The perfect time to come and admire the beautiful range of snowdrops planted throughout these local Leicestershire gardens. 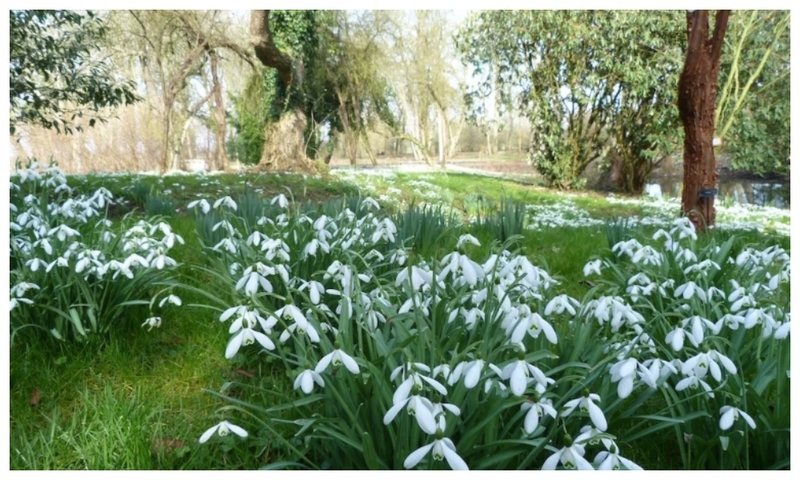 Catch the Snowdrop season from 23 – 24 February in Hinckley, Tilton on the Hill, Great Glen and at Bosworth House (just under 3 acres, almost completely organic garden and paddock with fabulous panoramic views) on 17 Feb. See more about these events here. One acre garden with lots of different areas, silver birch walk, wildlife pond with seating, apple tree garden, Mediterranean planted area and lawns surrounded with herbaceous plants and shrubs and a beautiful range of snowdrops. Group visits can be made with prior arrangement. £7 entry. Contact John Osborn on 01455 842609 to visit. They’re all peeping out now and it’s a gorgeous view over at the nature reserve. Open all year round and free to visit, this is a great one to visit with the whole family. The perfect time to come and admire the beautiful range of snowdrops planted throughout the gardens. Lots of common snowdrop as well as many rare and unusual varieties to see, all mixed in with so much other winter buds. On 6 Feb enjoy a Winter and Snowdrops breakfast and guided walk or head to the garden from 11 – 28 Feb to enjoy the fair beauties. Snowdrops in abundance over at Waterperry Gardens with over 80 varieties of the white bloomer springing up across the site’s impressive 60 acres. Among them are Galanthus ‘Evenley Double’, a special snowdrop which was developed and propagated on site, and other notable varieties such as ‘Hill Poe’ and ‘Lady Beatrix Stanley’. From 2 Feb – 3 Mar. Enjoy a refreshing stroll around the gardens to spy the snowdrops and emerging spring flowers. Our gardeners have been busy dividing and replanting spring bulbs in the woodland garden, dating back to the Victorian era. Sun 17 Feb. Light refreshments will be on sale in the carriage house. February is the perfect time to see snowdrops as they spring up around the park. There are lots to be found in the Pleasure Grounds, particularly in the lovely ferny dell at the bottom. There’s a bright display of snowdrops on the auricula theatre in the flower garden – you’ll see lots of different varieties of these harbingers of spring. Feb 3. From 16 -24 Feb get up and get out and enjoy a winter walk full of snowdrops and winter flowers. There will be small displays in the alpine bed to great drifts on the snowdrop bank – everything from pink cyclamen, yellow aconites and exquisite irises and crocuses as they mingle with single and double snowdrops and unusual hellebores in the woodland walk. Have I missed anything out? Where do you go to catch glimpses of these white bell shaped flowers? Let me know in the comment section below. There are at least two other gardens open for snowdrops on 23rd and 24th February 2019. Westview Garden in Great Glen (LE8 9EH) is a walled cottage garden where you will see over 300 varieties of snowdrops displayed throughout the garden, together with aconites, cyclamen, hellebores, early iris, and narcissus and winter flowering shrubs, plus lots of evergreen structure and trees to add to the perfect winter picture. The other garden is Hedgehog Hall in Tilton on the Hill, where the snowdrops are displayed in terraced beds. Both gardens are open from 11am until 4pm and offer homemade soup and rolls, plus tea/coffee and cakes. All entry money for the NGS (National Garden Scheme) and refreshments in aid of various charities. Pants for sale too! This is brill – I called Westview to check but didn’t hear back from them so thanks for confirming. Last sentence should read ‘plants for sale’!